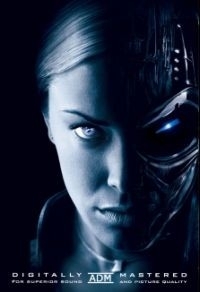 2) Eliminate John Connor (to her analysis, she did, since those “in the system” were taken out). -> Upon carrying out #3, she gets concrete evidence that #2 was not completed. -> If 2 and 3 are not accomplished in time to execute #4 by 6:18 p.m., execute the time-sensitive task of #4 before resuming 2 and 3 or proceeding to #5. Sgt. Candy scene restored as a pre-credits sequence. Closes with the signature drum fanfare I worked-up for the Cyberdyne scene in T1. T-X downloading John’s lieutenants is cut, so it looks more like she’s uploading the virus through the LA mainframe. (Since we start hearing about it afterwards, this works really well. It makes the T-X’s primary mission to ensure that Judgement Day actually happens). The names of John’s lieutenants are cut during the two assassination scenes, so it looks like she’s systematically taking out potential John Connors, much the way the T-101 did in T1 with Sarah. Her “gasp” after sampling “the real” John Connor’s blood is removed, because she wouldn’t have an emotional reaction like that. T-101′s explanation of the Lieutenants during the “escape” is removed. It is left in later as it sets up the events at Skynet without detriment to the story. She simply is carrying out another default program having failed to terminate John and Kate. The technical sides of this edit (audio, video, editing cuts etc) are all great – just not sure I like the overall effects of his choice of edits. Still, all 3 edits of “T3″ are better than the original. There is just to much plot inconsistency with this edit and the movie makes some leaps in favor or ridding the movie with a lot of “UGH” moments that it never quite makes a good, flowing film. If you can, then DL all three , watch all 3 and choose for yourself. I suggest you check out this editor’s other films – he has some good edits out there.